We changed the bold color in the kitchen to a more neutral color making it more appealing to a wide range of buyers. The hardware on this storm door was broken and allowed the door to swing all the way open, making it likely the door and house would be damaged. 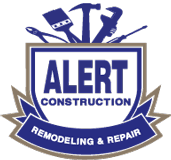 Alert Construction replaced the hardware with a new set and the door works properly again. The door stopper was missing and we replaced it with a new one. Door stoppers prevent wall damage. We patched the hole in this closet door. We painted this room with a fresh coat of paint. We fixed this French door which was damaged at the bottom. In this home the smoke detector was missing. We added permanent handrails to this property. We installed a new closet door where one was missing. We added a light fixture to replace a missing one. This hole was once a pond. It was left in the yard as an unfinished project which also posed a safety hazzard. We filled in the pond making it level with the backyard. This vinyl sided home just needed to be power washed to show off it's great color. We changed the white range in this kitchen to a new black range. In the before picture the kitchen is missing a microwave hood. We installed a new microwave to match the new black oven. Cabinet doors were also added. With the popularity of digital cable, we are asked to remove satellite dishes of all sizes. The existing register was rusty and old. We replaced it with a new updated register. We replaced this mailbox which was falling over. Removal of carpet and padding to subfloor in this room. Alert Construction installed a new interior door in this customers home where there was not one previously. We replaced this cabinet door for the homeowner. Several of the pickets on this deck had broken off. We replaced the missing pickets so that the deck would look complete and be much safer for small children or dogs to walk around on. We replaced this dryer vent in the siding the right way. This downspout now functions to bring water down and away from the home. Vinyl corner trim was replaced against the siding. We replaced the entire subfloor. A fire burned most of this second story deck. Alert was able to remove any damaged decking and railing, and replace the materials so the deck is now safe and sturdy for the homeowner's use. The drywall before was stained. Alert was able to repair the drywall and repaint the room to provide a clean and fresh look to the entire space. This old smoke detector was hanging from the ceiling. Alert replaced the unit with a more modern, updated unit, and remounted the smoke detector so it no longer hangs dangerously. This window was missing window locks so we added two new locks. We replaced the underwater sea toilet lid with a neutral lid. There was no baseboard trim and bare subfloor in this Greensboro home. We completed the room by installing newly painted baseboard trim and carpeting. The laundry room did not have any doors. We installed new bi-fold doors.